Trade Impact: Low Prices Versus Threatened Jobs? Consumers face many challenges post-Brexit. First, there is the trade impact of Brexit itself; then there is potentially new regulations; third there is the consumer policy dimension both at a national level and in new trade deals with third countries. In the context of rising scepticism about trade liberalisation reflected in the Trump and Brexit victories, consumers are being squeezed by two forces. On the one hand, increased scepticism about free trade puts at risk the classic gains from trade: lower prices and increased competition brought about by tariff reductions and gives rise to fears of job losses from increased imports. On the other hand, some fear that the direct consequence of Brexit will be weaker consumer protection legislation and that, in the longer term, UK bilateral Free Trade Agreements with third countries may involve regulatory changes that could undermine consumer protection, (the infamous chlorinated chicken). In the addition to these substantive issues there are procedural questions too. How is consumer interest represented? Post Brexit UK would have a Trade Defence policy, potentially including anti-dumping, countervailing and safeguard measures. Whilst most economists would argue that these are bad ways to deal with the adjustment costs of trade expansion, political pressures may sometimes be irresistible. The new UK Trade White Paper published by the Department for International Trade in October 2017 has stated that it will give a major priority to consumers both in traditional ways and to avoid erosion of regulatory standards, but details remain to be spelled out. Consumers in the UK are currently facing a number of new challenges. Whilst will be certain until the details of the EU-UK negotiations are known, there is a distinct possibility that tariffs will be imposed on UK imports from the EU. This, and extra administrative burdens on trade flows that will occur even if there is a post-Brexit UK-EU Free Trade Agreement, will raise consumer prices. At the same time, there is a possibility that despite the government’s avowed commitment to free trade the anti-globalisation forces that have been powerful in the US and in the rest of Europe may also prove hard to resist here. The sensitivity of vulnerable groups to import competition may lead to protectionist pressures, particularly in hardest hit and most influential sectors. Whilst the eventual impact of Brexit may well be to allow liberalism of trade we need to bear in mind that the immediate impact will be to raise barriers with our largest trading partner. Another concern is that the UK may seek to boost its international competitiveness through deregulation – removing not only redundant rules but also regulations that genuinely protect consumers. There is worry that future non-EU trade agreements such as a UK-US Trade agreement might offer the occasion to do this. Even if the initial provisions seem acceptable, there may be downstream implications of, for example, Investor State Dispute Settlement (ISDS), that could indirectly undermine the UK’s domestic laws. The DIT White Paper has promised that this will not happen, but there will undoubtedly be pressures in that direction. The core of the argument for free trade is that it has a direct effect on average living standards by lowering prices to consumers, whilst at the same time creating incentives for resources to move into more competitive industries, although this reallocation involves people changing jobs. Much research recently has concerned the US where the overall net impact of trade on consumer prices seems to be favourable, especially to poorer consumers who typically spend a high share of their income on traded goods. One recent study estimated that, in the US, trade liberalisation between China and the USA lowered the cost of living by 7.3% between 2000 and 2006. For the UK, work by the UKTPO and the Resolution Foundation looked at the impact on consumer prices from a so-called “MFN Brexit”, in which the UK would impose tariffs on imports from the EU at the same rate as on goods from the rest of the world. (Current policy is that the UK would initially keep the same tariffs at the current level based on the EU Common External Tariff). Whilst price effects would vary across products, the average price of consumer goods would rise by 2.7%. The impact would vary across regions and households, but the evidence suggests that poorer households would be harder hit because their consumption spending is disproportionately oriented towards goods which bear higher tariffs such as food. However, economic theory has never claimed that the gains from trade will go to everyone equally or even that there will be no losers. The theory of comparative advantage has always recognised that the gains from trade and specialisation require inefficient sectors to close down, with free trade optimists emphasising the likely opening up of new, better jobs. Sensible economists have always insisted that even this is likely to involve transitional unemployment. The more complex models of trade remind us that opening to trade with other countries will permanently alter relative prices and wages so that if people have different skill sets, some will gain and some will lose, permanently. This might take the form of lower wages or lost jobs if wages do not fall. However, recent empirical research especially by Autor et al in the US has suggested that the losses are larger and longer lasting than sometimes thought. On the other hand, de Long and others have shown that trade effects are small relative to factors such as technical change, the decline of trade unions and the rise in the market power of CEOs. Other studies have suggested that price falls due to Chinese imports have tended to benefit the poor in rich countries even as the job market effects have hurt them. Paul Krugman has written on the impact of trade on jobs. Twenty years ago, he argued that the scale of Chinese imports into the US was so small that the impact on jobs was negligible. In 2007 he revised his view and argued the impact of Chinese competition was more than anticipated. Recent estimates of overall job losses due to NAFTA also suggest that they are quite low. The recent World Bank/IMF/WTO report argues that policies must be adopted that take account of losers. The dilemma for policy makers is that, as Autor et al have shown, the costs to losers may be very long lasting. Yet, any attempt to reduce the impact of trade is likely to hurt consumers. The question is whether one can find a way to offset the negative impact of trade “shocks” whilst keeping the gains. The October 2017 UK Trade White paper stresses that consumer gains from trade is its top priority. But it acknowledges that: “The positive impacts of trade for producers and consumers, importers and exporters, are numerous, but the benefits are not always universally felt.” The government proposes to use the Industrial Strategy as a way to manage “transition,” but it also admits that there will be times when political pressures for protection will be irresistible. There is a need for a clear discussion about whether compensation should be made via higher consumer prices or through tax-funded spending. Traditionally one of the main trade policy tools to mitigate the impact of imports on producers (including workers) is the use of anti-dumping or countervailing (anti subsidy) duties, which can be deployed when foreign producers are deemed to be injuring domestic producers through “unfair” trade practices. Consumer interests are rarely, if ever, taken into account in anti-dumping actions, where there is a clear and intentional tilt towards protecting producers against the impact of what are alleged to be “unfairly” low import prices. The WTO allows countries to raise tariffs when other countries’ goods are sold “below normal value” and industries can be shown to be “injured”. This will inevitably put up prices to consumers (who may be industrial users). While there are sometimes cases of injurious dumping, anti-dumping duties are not a suitable way of managing a loss of competitiveness or change in comparative advantage. This is more efficiently achieved by other means such as macro policy, regional policy, industrial policy or active labour market policies which target the regions or workers affected. Anti-dumping allows all firms in an industry to put prices up – and risks anti-competitive outcomes, at the expense of consumers. Politically, however, other policies may be constrained as they cost money to the budget whereas trade protection imposes a cost on consumers which does not show up fiscally. If there is political pressure for trade policy interventions, it is extremely important that it should be done in the full knowledge of the consumer costs being inflicted so that a rational trade-off can be made. Even in jurisdictions such as the EU which have a public interest test, there is no systematic attempt to balance consumer vs producer interests. The aim of anti-dumping is to increase prices to consumers! Early EU anti-dumping decisions typically examined the impact on down-stream businesses and would argue that if there were in a position to pass the costs of anti-dumping duties on their inputs on to users and consumers this meant there was no negative community interest! Often the Commission would state that the consumer interest in sustaining a viable EU producer base would offset any costs generated by the duties. 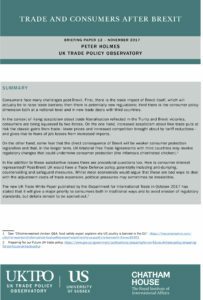 The UK Trade White Paper has outlined a framework for the use of “trade remedies”, i.e. anti-dumping, countervailing duties and safeguards. It speaks of the need to combat “unfair” trade practices, but promises to include an efficiency test that will take consumers into account. Whereas within the EU, the DirectorateGeneral for Trade judges both dumping and injury, the US has a system under which the Department of Commerce assesses whether there has been dumping and the independent International Trade Commission decides if there has been injury to US firms. This removes some of the bias towards politically powerful producers, but still leaves the decision to politicians. It is probably unrealistic to expect that all antidumping decisions in a post-Brexit UK could be left to an independent agency, since anti-dumping is inherently political. However, given the White Paper’s promise of transparency it is reasonable to suggest that it is necessary to include an independent audit of the costs to consumers and downstream users of anti-dumping actions. The second major theme that needs to be addressed is the role of trade policy in affecting the right to regulate. There were many fears after 1994 that the WTO would constrain its members’ ability to use health and safety and environmental regulations that might affect trade. Research reviewing the most relevant dispute cases tends towards the conclusion that the WTO Appellate Body (AB) has been quite successful in reconciling trade and other objectives. Broadly speaking, they have ruled that governments may use domestic regulation to achieve any legitimate aim for the protection of consumers or the environment provided that the means are in a very broad sense necessary (which is interpreted almost as generously as the EU’s rule that measures taken must be “proportional” to the problem they are designed to solve) and not arbitrarily discriminatory. For example, in the Canada vs EU Asbestos dispute over France’s ban on the import of asbestos products, the AB noted that the ban on asbestos was to protect human life. Therefore, if there was no reasonable way to protect people without a total sales ban that also covered imports, this was allowable. WTO cases often highlight the nature of the tension between consumers in the North and producers in the South, if the “right to regulate” in the North poses a threat to exports in the South. As we noted, this problem seems to have eased as a result of judicious decisions by the WTO Appellate Body. However, from a consumer perspective, it is very important to ensure that producer interests are not able to insist on protectionism in the name of protecting consumers. This issue was neatly highlighted in the Peruvian Sardine case, in which the UK Consumers Association was able to provide evidence for the Peruvian submission that challenged EU labelling rules that did not benefit consumers. When rules on production process methods (PPMs) affect the characteristics of the finished product, the WTO position is straightforward. However, some PPMs do not affect final product characteristics – and are known as “non-product-related” (NPR) PPM requirements. These requirements are mostly based upon life-cycle considerations associated with processes or production methods, such as the energy consumed or the type of labour used to manufacture the product. NPR PPMs are controversial within the WTO framework, for while the GATT (one of the agreements underlying the WTO) rules out treatment that discriminates either between “like products” from different trading partners, or between foreign and domestic “like products”, the situation is less clear when the intervention differentiates between products on the basis only of PPMs. It is widely agreed that Border Carbon Adjustment duties on imported products made with high carbon emissions to compensate for the fact that they had not paid a carbon tax in their country of origin would not, per se, be illegal, though this assessment is based on limited case law. A study was undertaken for the European Commission on how WTO law would deal with NPR PPMs where countries seek to control imports made in ways that violate some ethical norm, such as animal welfare or local environmental rules, where developed countries might wish to restrict imports made in ways that violated the collective preferences of consumers. It sought to examine the consequences for consumers when their utility was affected by the nature of what other people consumed. The conclusion was that imposing trade restrictions would actually be legally possible if somewhat disruptive, though there was little evidence that consumers might want such measures, as evidenced by their willingness to pay for ethically sourced products. One of the most heated issues on the regulatory agenda is Investor State Dispute Settlement (ISDS). This may allow multinational firms to challenge domestic laws that could affect their interests and which are deemed to violate a notion of fair treatment enshrined in Bilateral Investment Treaties (BITs), on the grounds that the legislation violates an implicit or explicit promise that had been made. Notorious cases recently have involved Phillip Morris challenging Australian and Uruguayan laws on cigarette packaging (ultimately unsuccessfully). The problem with agreements providing for ISDS is that they are often loosely worded and leave it to private tribunals, who are answerable to nobody and not bound by precedents, to determine what is “fair and equitable treatment” of firms. Investment agreements with ISDS are not new. Bilateral Investment Treaties (BITs) have existed since the 1950s. One of the first was Germany-Pakistan. They were initially welcomed by developing country governments as a way of credibly committing to investment deals and reassuring foreign investors sufficiently that investments actually occurred. There is much dispute about whether they really do attract investment, and the burdens have increasingly become salient. BITs mostly stand outside of FTAs and often contain binding investor-state dispute settlement provisions when the corresponding FTAs do not have binding dispute settlement. The UK has a great number of individual BITs which still apply now and after Brexit, and it has used ISDS in a number of cases. In fact, many EU member states have long-standing BITs with each other. So the issues regarding BITs and ISDS do not only concern new and third-party extra-EU arrangements. If the UK is introducing new investment agreements or reviewing old ones it clearly needs to use this opportunity to ensure that its right to regulate is not unduly curtailed. The White Paper has argued that the UK government does not want a race to the bottom, but the UK must be careful to avoid tying its hands unwittingly through ISDS provisions in BITs, and the consequent ability of tribunals to impose restrictions on the UK. The EU experienced a huge backlash from consumer groups and other NGOs to its recent ISDS proposals and although some see recent proposals by the EU as an improvement, the EU may have to drop these provisions in its new agreements. For the UK with its strong legal system, it is questionable how far ISDS is needed to attract investment to the UK. This raises a basic regulatory issue for consumers, the signing of open-ended commitments to limit regulatory powers in trade agreements in order to facilitate trade. This is a dilemma inherent in trade policy; since the signing of the GATT, governments have accepted limits on their ability to regulate completely freely in order to ensure predictability of the market. A related reason is that governments will sometimes sign trade agreements to insulate themselves against pressures from special interest lobbyists for regulatory protection. The notion of tying one’s hands via external constraints has become extremely controversial in the context of Brexit as it cedes (or at least pools) sovereignty. One of the main arguments against the TransAtlantic Trade and Investment Partnership (TTIP) was that it could have led to unknown limits on future sovereignty, notably via the unpredictable element of ISDS. A US-EU TTIP is off the agenda for the time being, but a UK-US deal could possibly include, either explicitly or as a consequence, relaxation of EU SPS (Food Safety) rules to allow access for US agricultural products. As we have noted, the government has promised not to engage in a regulatory “race to the bottom” and that there would be no automatic acceptance in any such deal of controversial rules such as that allowing the infamous “chlorination chicken”. The last sentence of this is a reminder that consumers also have a clear interest in the services element in any future trade agreements. The UK has been a keen supporter of the non-WTO Trade in Services Agreement TiSA. As A. Long has observed, the expansion of trading opportunities in services is potentially in consumers’ interests, but the secrecy of the negotiations is a matter of concern. The need to ensure speedy publication of documents is clearly important. The EU’s negotiating position on TiSA was moderately clear. Consumers will need to press the government on its aims for the UK. The EU has published its draft TiSA offer, including proposals for the UK, and it has to be hoped that the UK will clarify whether the same UK terms would apply post-Brexit. Finally, it is worth noting that there are a number of other “trade and” areas that affect consumers. The UK will have to consider how to place itself in discussions on international competition policy. Control of global cartels and dominant firms has been hitherto undertaken by the European Commission. Defending consumers against giant firms is a daunting task and the UK will have to consider how far it wishes to go it alone or seek international cooperation. A related area is that of Intellectual Property Rights which affect consumers in many ways in terms of lower prices versus the potential stimulation of innovation. The UK remains bound by WTO TRIPS commitments but these offer significant flexibility. Opinions have swung in recent years with some authors questioning the value of the patent system as a driver of innovation when R&D is sequential. It would be highly tempting for the UK to go for stronger Intellectual Property protection to encourage knowledge-based industries, but the implications of this need to be carefully and publicly thought through. The current trade landscape is so murky that clear conclusions are difficult. One point is clear: there are gains from trade, from lower prices and better choice, which consumers need to preserve, whatever one may feel about the gains from further liberalisation. But it will be important to ensure that gains from cost savings and new technology benefit consumers and not simply owners of Intellectual Property Rights. A basic message of this paper is that the classic issues of trade policy and consumer interests remain as significant as ever. The debate about regulatory sovereignty has resurfaced in the context of FTAs rather than the WTO, especially ISDS. Yet, there is enhanced political salience of the distributional impact. Clearly, a vital issue concerns the transparency of the negotiating processes. Consumers have much to lose if trade barriers rise. It is therefore essential that the negotiations on new trade deals are not undertaken in such a way as to undermine public confidence in open trade. Consumer groups have justifiably been critical of the opacity of some discussions. The EU does seem to have responded to this and whilst the new UK Trade White Paper refers to transparency in the context of trade defence remedies, it does not make explicit commitments in the context of trade negotiations. Many thanks to Kamala Dawar for input into an earlier version and to L Alan Winters for detailed comments. The author wishes to acknowledge the support of Consumers International with an earlier version of this paper. Peter Holmes asserts his moral right to be identified as the author of this publication. Readers are encouraged to reproduce material from UKTPO for their own publications, as long as they are not being sold commercially. As copyright holder, UKTPO requests due acknowledgement. For online use, we ask readers to link to the original resource on the UKTPO website. Changing Lanes: The impact of different post-Brexit trading policies on the cost of living http://blogs.sussex.ac.uk/uktpo/files/2017/10/Changing-Lanes.pdf and Stephen Clarke, Ilona Serwicka and L. Alan Winters ‘Will Brexit raise the cost of living in the UK’, National Institute Economic Review, November 2017. Autor, David H, David Dorn and Gordon H. Hanson. 2013. “TheChina Syndrome: Local Labor Market Effects of Import Competitionin the United States.” American Economic Review, 103(6): 2121-68. See also the debate about Milanovics ”Elephant graph” https://www.bloomberg.com/news/articles/2016-06-27/get-readyto-see-this-globalization-elephant-chart-over-and-over-again; and, R Baldwin’s arguments in The Great Convergence (Harvard, Belknap 2016) about the implications of advanced coluntry technology/IPRbeing combined with low wage labour. Closely related to these types of measure there are also “safeguard duties where disruption is caused to a domestic industry without any “unfairness”. These tariff surcharges must be compensated by tariff reductions somewhere else and hence are less popular than AD or CVD duties. Related instruments are anti-subsidy (Countervailing) duties and Safeguard duties which can be applied in the event of disruptive trade surges. EC – Abestos, T/DS135/AB/R para. 172. A similar conclusion was reached in the Brazil – Retreaded Tyres dispute DS 332 Brazil — Retreaded Tyres, para. 170. The problem is not unlike the concern over submitting to the jurisdiction of the ECJ.